You have got a little over two days in Gujarat and wondering what to do? Try exploring the beautiful cities of Ahmedabad, Somnath and Sasan Gir. At the end of it, if this is a mix of all age group people travelling together, everyone will have something in store for them – I promise. When my husband Narayanan and I landed late night in the month of December, the chill breeze outside the airport put a BIG smile on my face. I was so excited to meet my Grandparents, Aunt and my Uncle’s family after a long time. The next morning, after all the talking, laughing and eating to hearts content with my family, it was time to wear the exploration hat and head out. My uncle and aunt helped us with a local taxi service provider that they knew to take us to the places that we wanted to see. Meanwhile my friends Praveen and Ramesh had also landed in Ahmedabad and decided to meet them in Sarkhej Roza – our first destination for the day. A mosque at the outskirts of Ahmedabad is one of the most peaceful (read less crowded) places I had been to that day. There were not many visitors but for architecture students who were clicking photos and drawing the elevation. This is one of a kind mosque and mausoleum which is known not just for the Islamic architecture but a combination of Persian, Hindu and Jain styles. This monument is spread over 17 acres which also includes a lake(currently dried). You will be mesmerised in this simple yet exquisite beauty. Be prepared to spend a minimum of 45 mins to explore and fall in love with this place, especially with the designs. From here, we headed to Adalej Stepwell – which was one of the places that I have always wanted to see after the Pushkarni in Hampi. This is five stories deep water well which was used for drinking, washing and other day to day activities that require water. Stepwell is also called Vav in Gujarati and these pillars are intricately and accurately designed. Photographers go crazy shooting the illusion of the steps and the marvellously designed pillars. These along with the greenish water does take you back in time and make you land in the “WOW”land. I was not wanting to get out of this place – otherwise one can spend approx 40-60 mins here. By the time we left from Adalaj, we were hungry and went to Handi Restaurant to catch up with some yummy food. After our tummies were full, we drove to that place one cannot miss once you are in Ahmedabad – the home of Mahatma Gandhi. As mentioned earlier, this ashram was home Mahatma Gandhi which overlooks the river Sabarmati. This place was quite and one of those places that takes you back in history with so many thoughts that race within your head. The ashram makes you experience many emotions as its a testimony where many leaders have been to, stayed, spent time and discussed many important issues that were related to India’s freedom struggle. On the other side is the Sabarmati river. It is so well maintained and the entire surrounding is clean and neat. From here, I wanted to go shopping before heading to Kankaria Lake. I wanted to buy bed sheets and explore a bit more of the traditional clothes like the Ghagra Cholis etc. After negotiating hard to buy bed sheets and bed covers, we headed to the lake and spent some time there before leaving for dinner. This is the biggest lake in Ahmedabad and the lights around it was visually appealing.This place has lots of entertaining facilities such as toy trains to take you around the lake, a stationed Hot Air Ballon ride, water rides etc.Locals told us that the lake looks stunning during Sunsets as well – so if you have the time to make it by then, let me know how it went. After dinner, we took the train from Ahmedabad at 1030 PM to Veraval Station that was scheduled to reach by 0625 AM. Quick Info: Train No: 19921 Somnath Express. Total expenses for 4 of us including Train to Veraval, Food, travel to Somnath and Gir, travel to Gir forest all ended up at Rs. 5700. Resort Stay: Rs. 4830 per room (after using discounts on Goibibo). We booked two rooms. This temple is one among the 12 Jyotirlingas and has been destroyed and rebuilt several times. The temple is open from 0600-2100 hrs and offers Aarti three times a day – 0700hrs, 1200hrs and 1900hrs. There is also another small temple nearby. We checked into Hotel Toran at around 645AM to freshen up in Veraval as suggested by my friend. From here, we took an auto (the same auto which picked us up from the Railway Station) and drove all the way to Somnath Mandir which was about 15-20 mins. We stopped at Shree Somnath Maheswari Atithi Gruh in Somnath to drop all our bags, belongings etc. To go inside the temple, you are not allowed to take mobile phones, belts were asked to be removed and you cannot take any belongings. We had a blissful darshan, spent few mins watching the sea and headed to have breakfast in hotel. You can consider this hotel for stay as the rooms were well maintained and the food was decent. There is a small Lord Krishna temple named Bhalka Thirtha. This place is famous as locals say that this was the place were Krishna was shot in his leg and he succumbed to mortal wounds. Quick Info: The resorts in Gir offer you rooms which includes breakfast, lunch and dinner. 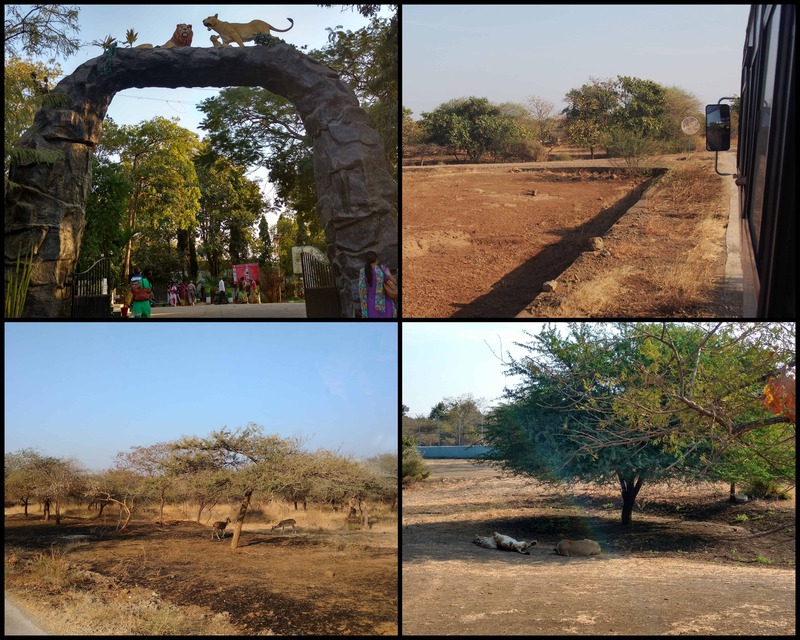 The same morning, at around 1000AM we headed to Sasan Gir which is the wildlife sanctuary in Gujarat. Took a share auto from the temple for Rs. 800 and the journey was about 1hr30 mins – roughly 45kms to reach our resort.We checked into Amidhara Avezika Resort, had lunch and were ready for a Jeep Safari trip into one of the largest homes of Asiatic Lions. Our bad luck, the safari got cancelled the last minute. Nonetheless, we decided to go to the Gir National Forest for a bus trip which takes you into the wildness. We spotted many deers, sambar, leopard, a very weird looking cow called Nilgai and few lioness’s sleeping and relaxing under the shade in two-three places. This made my day (although the safari would have made us go crazy). Please ensure you book the safari much in advance through online links or check with the resorts to never miss the Safari like we did. After the tour, we bought few tee-shirts from the shop and headed our way back. While returning, we spotted a small home-run dhaba near a huge Coriander farm.Try stopping here to have one of the best Poha, Thepla and Chai. We played snooker for a while in the resort, had yummy dinner and retired for the day. The next day morning – at around 600AM we were ready to drive to Bhuj. With this I’m wrapping up what you can do for two days in Gujarat. Read here on how we zeroed in on Gujarat and the itinerary.